Fiberstars is a global provider of advanced niche lighting products. With over 25 years in the lighting industry the company has evolved from a fiber optic business into a reputable provider of LED lighting solutions. Star Bottom Floors by Fiberstars is the simplest, easiest way of putting the evening stars in the bottom of your next pool. 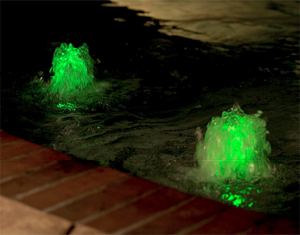 Light Streams Star Floor Kits are the perfect way to add a twinkle to the bottom of your pool. Each Star Floor Kit comes with either 10 points of light or 25 points of light that have 2 strands of fiber each. The PAL TREO is a retrofitable even glow 12VAC, 5 watt LED underwater light that features soft, evenly distributed light due to the unique design of the molded prismatic lens. 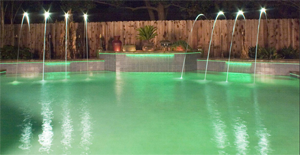 This design provides outstanding illumination qualities, eliminating the end shadow effect common with other pool lights. Color Light Streams offer an LED light source with 6 locking colors, 2 color change modes, 3 selectable start modes and self synchronizes with all Color Light Stream products; Lighted Rain Waterfalls, Laminar Fountains, Bubblers, Star Floors and Rock Waterfalls. 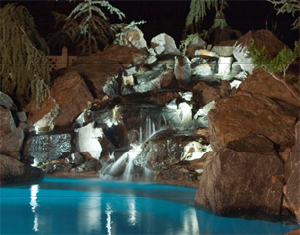 The Power Tower was designed for seamless conversion of an existing fiber optic pool lighting system to a LED pool lighting system. The Power Tower is a remote control power center for the PAL Treo family of lighting products. To learn more about the FiberStar lineup of products, visit our FiberStars webpage or contact your Export Manager.